The hype surrounding Red Dead Redemption 2 has been building for months now. From story teasers and screenshot drops to crossover content with GTA, we’ve all been collectively on the lookout for more content. Luckily for us, as promised by Rockstar Games, the first gameplay trailer has been released. This Red Dead Redemption 2 trailer is a six-minute window into the game, exclusively featuring video captured in-game. A narrator goes over everything throughout the video, explaining important information about what people are seeing. This Red Dead Redemption 2 trailer immediately throws us into the action, quite literally starting off with a bang. We’re then reminded of the game’s setting and given some historical context. The game thrusts us into a shifting time in American history, one when the age of outlaws is ending. The game aims to combine action, storytelling, and gameplay in new ways. We see a range of settings in the footage. There are natural environments, like mountains and dense forests, as well as more modern cities. A strong emphasis is placed on the diverse and lively cast of characters you’ll meet as you play as Arthur Morgan, a trusted senior gun in the Van der Linde Gang. In Red Dead Redemption 2, your interactions with people matter. Your choices will shape your experience, and getting to know more people can help you learn secrets and open up side quests. You’ll have the option to interact with non-playable characters in the world, both in casual and severe ways. These kinds of actions include paying someone compliment as you pass them or starting a fight in a bar. A large portion of this Red Dead Redemption 2 trailer examined the role camps play in the game. When forced to leave an area, the gang sets up a camp. You’ll get to know your fellow gang members as you play, and you’ll want to keep morale high by providing resources and building relationships with them. Your interactions with the world aren’t limited to dealing with the people in it. Hunting plays a large role in Red Dead Redemption 2, as it can help support your camp and earn you money. But watch out, because the animals are just as temperamental as people can be. Speaking of animals, your relationship with your horse is also important in Red Dead Redemption 2. You can avoid having a rebellious horse by treating it well throughout your playthrough. Shooting and fighting have apparently been improved in Red Dead Redemption 2 as well, but exact details have not been announced. 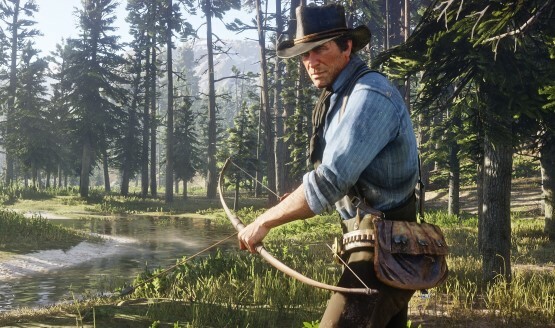 The next gameplay trailer will look at missions, activities, enemy gangs, robberies, sharp shooting with the Dead Eye Targeting system, and more. What are your thoughts on the Red Dead Redemption 2 gameplay trailer? How much more do you think we’ll see before the game releases October 26, 2018 on the PlayStation 4 and Xbox One?